Did you know that you could have the best of both worlds in Leiden – an accredited American university degree while living in the Netherlands? When asking students at Webster Leiden Campus “where are you from?”, there is usually a story to tell! Come share your story with us at our Open Day! 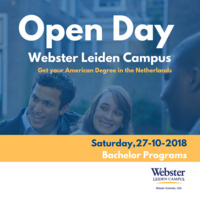 On Saturday October 27th, Webster Leiden Campus will open its doors to parents and prospective students interested in a Webster Bachelor program. The day will be a great opportunity to experience a sample class, tour the campus and housing options, speak to current students about clubs, and ask questions about the application process during Q&A.